Through two weeks, I still have no idea if Penn State is a really good football team. And the next two weeks won’t tell us much, either. We’re all just going to have to wait until Ohio State visits on Sept. 29 to find out. The Nittany Lions barely won their opener in overtime against an Appalachian State team that looks decent, then destroyed a Pitt team that embarrassed itself, 51-6, Saturday at Heinz Field. The final score against Pitt was jaw dropping, but does anyone honestly believe Penn State played anywhere near as well as that score would indicate? If someone would have told you all the final statistics beforehand, you’d think the Lions had prevailed something like 30-23. It was a blowout of historic proportions because Pitt looked pathetic for much of the game, its special teams were an absolute joke and its passing game was pitiful. Penn State deserves a lot of credit for making good adjustments on both sides of the ball at halftime. I can just copy and paste that last sentence to include in recap after recap after recap. Because at this point in James Franklin’s tenure, the one thing his players and coaches have proven more than anything else is that they know how to make and implement halftime adjustments. The fact of the matter, though, is that Pitt rushed for 214 yards in the first half, when Penn State’s run defense looked awful. The Lions were lucky that Pitt’s passing game was so inept because even a slightly competent air attack would have helped the Panthers finish off some drives and score somewhere around 17 to 20 points, which would have been enough for the lead. Instead, Pitt managed only six points and went into halftime trailing after its punter fumbled a snap, leading to a last-minute TD for Penn State in the first half. If the Lions had been playing against a balanced offense such as Ohio State or Wisconsin on Saturday, there’s no reason to believe they would have been able to prevent giving up 30 or more points. That Pitt managed only six points is comical and should be humiliating for big-mouthed, can’t-back-it-up coach Pat Narduzzi. Defense wasn’t the only concern for Penn State on Saturday. The offense had its problems, too, with dropped passes and fumbles. Many younger players are being put into key roles this season, and while they will improve, the learning curve is steep at this level. Going back to the Appalachian State game, the Lions’ defense allowed just three points through three quarters, then gave up a whopping 28 points in the fourth and nearly lost as the visitors took a late lead in regulation. It’s not unusual for a team to be inconsistent early in the season. But Penn State has taken it to an extreme thus far. Of the team’s eight quarters, five have been really good, one was absolutely atrocious (fourth against App State) and two were terrible (first two against Pitt). I’m beating a dead horse here, but it’s a testament to how badly Pitt finished drives and how poorly coached that team is that it didn’t have the lead at the half Saturday. On the coaching aspect, one thing that doesn’t get talked about enough is that Franklin has proven to be an excellent coach when it comes to having the Lions play clean, fundamentally sound football without beating themselves. Penn State rarely has many penalties or turnovers, and the players usually keep their cool on the field in tough spots. Those sorts of things can get taken for granted, but my goodness, after watching Pitt and Narduzzi embarrass themselves time and again Saturday, I just wanted the game to end as quickly as possible because I felt sorry for the Panthers. Penn State hosts Kent State this week. It’s essentially a practice game, and even if the Lions have another uneven performance, they’ll still win in a rout. Next week it’s off to Illinois for a bizarre, but get-used-to-it Friday night game. 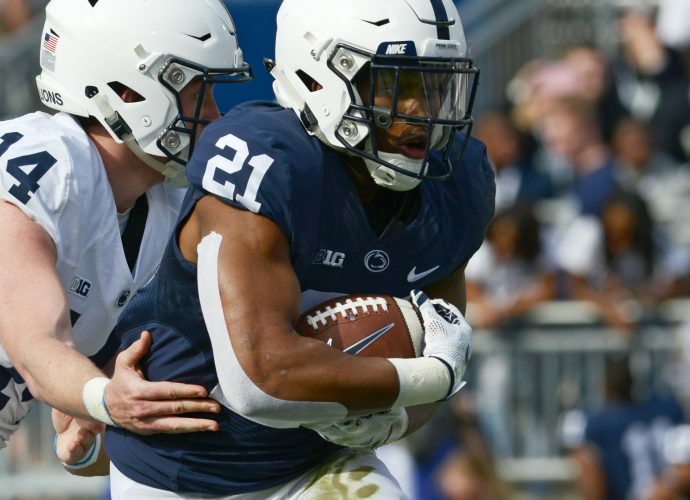 The Illini are really bad, Penn State will be favored by three touchdowns or so, and even a comfortable victory won’t reveal much about the Lions. So we must wait until the Buckeyes visit on Sept. 29 before we’ll have any idea if Penn State truly is a Big Ten or College Football Playoff contender. Urban Meyer will be back for that game, assuming he doesn’t tell more blatant, disturbing lies that get him into further trouble. Ohio State also will bring a terrific offense to Beaver Stadium, one that can run the ball with Mike Weber and a strong offensive line, plus throw it with new starter Dwayne Haskins, who has completed an incredible 79.2 percent of his passes so far (42-of-53) for 546 yards. Penn State is 2-0 but still has a lot of work to do and a lot of questions to answer. It’s got two weeks to answer those questions and be ready for the Buckeyes in a game that, as usual, will be the biggest of the year for the Lions.